It's always entertaining to open up a piano and discover things that shouldn't be there. Pens and pencils are pretty much at the top of the list, with paperclips a close second. Grand pianos seem especially prone to swallowing things - the open fallboard is shaped just right to funnel these things down and into the action. Pennies, dimes, and nickels are notorious for finding their way into the spaces between the keys. Rounding out the collection are: playing cards and postcards; pieces of children's toys; bits of candy; crayons; nuts and seeds stored by mice (and their little poops); rubber mutes, small piano parts, and bits of felt and paper and wood left by previous tuners. Things often show up on the floor of uprights, behind the bottom board. My favorite is the old glass jar that held water a million years ago, meant to humidify the piano. I found a piano with what appeared to be the entire contents of a file cabinet drawer stuffed down there, perhaps by a child delighted to find a slot above the board at the right height that could swallow paper endlessly. Piano tuners sometimes store broken bass strings down there, or other things that they intend to repair some day. Does anyone know what this is? My customer today handed it to me, having found it somewhere inside her piano. It was in a plastic bag with a few ancient bass strings. This must be what piano tuners do, she had imagined, store their tools inside their customers' pianos. It's a tuning wrench of some sort, quite old it seems, with tuning tips welded at both ends. The tips have square openings, and they are oriented nearly 90 degrees to each other, so it's an offset tuning wrench. But I can't imagine what it would be used for. It would be too awkward for regular tuning - maybe it's for extracting tuning pins after the strings have been removed. People always want to know if I find money inside pianos. Aside from the aforementioned pennies and dimes, I have been enriched by the occasional quarters I find. But one time I removed the bottom board of a spinet and found a wad of cash, which I handed to the owner. There was just enough money to pay for the tuning. When I finish a tuning at a customer's home, I usually run through a bunch of major arpeggios up and down the piano. Then I finish off with a big C11 arpeggio. It's just a habit, but it serves a couple of purposes. First, I'm just "tasting" the piano's tone, now that it's in tune. Second, I'm quickly checking octaves to make sure one or more sections haven't shifted during the tuning. Third, I'm signaling to the customer that I'm done. Sometimes after I close up the piano, the customer, or, more likely, the customer's child, will sit and play a bit. And I don't know why, but the piano always sounds a little out of tune to me, even though when I played it I was satisfied. Maybe it's because the piano sounds different from a different vantage point, or I'm just paranoid about the quality of my unisons. I've learned to not respond to my apparently distorted perception - I listen to and applaud the child, or marvel at the octogenarian ripping off some ragtime, or sit quietly and write out my bill. But I do love it when I leave the house, and as I get into my car, I can hear my customer in the house, playing up a storm. The dampers in a piano run from the first note up to about the 68th note, the E two octaves above middle C, which is called E6. After that, there really is no need for dampers because the strings don't ring out for very long. Some pianos run dampers 5 or 6 notes above E6, but most piano manufacturers avoid the extra cost and stop at E6 (or try to cut it a bit short one or two notes). Most of the time you don't notice where the dampers leave off, but a sensitive player will always notice. Sometimes it can be annoying, because the notes just after the last damper can't really be played staccato, and the transition from damper to no-damper is abrupt both for the hand and for the ear. In an attempt to ameliorate this abrupt transition, Yamaha uses a partial damper felt on its last damper, E6. The idea is that D#6 damps fully, E6 damps partially, and F6 damps not at all - voilà, a smooth transition! Except not really. It's a nice idea, and probably a nice marketing point, but listen carefully to the transition, and you might hear what I'm hearing as the notes die out. The sound in a piano comes from hammers hitting strings. As soon as a string is struck, it vibrates and transmits most of its energy ultimately to the soundboard, thence to the air as sound waves. As the string gives up its energy, the volume of the sound decreases, a process called decay. Decay begins immediately after the string is struck, and is rapid at first, but then the decay rate drops quickly. In a good piano, the decay rate slows significantly; the string can ring out, at a moderate yet still decreasing volume, for a long time. Here's my beef with Yamaha's partial damper. D#6, E6, and F6 all have a similar decay, as one would hope. D#6 can also have its sound damped, and F6 cannot. But when you damp E6, only two of the three strings are damped. The third string rings out, but it decays at a significantly different rate than F6. Instead of hearing a smooth transition, I actually hear two different transitions; the one from D#6 to E6, and the one from E6 to F6. Call me sensitive, but it drives me crazy; I'd rather have the one abrupt transition. The reason the decay is different, by the way, is because a single string transfers energy to the soundboard differently than three strings vibrating in phase. Of course, the difference is greater in the early part of the decay. Towards the end of the decay, the difference is negligible to none. But if you're relying on the damper to do its job, you usually want to apply it in the early part of the decay. Well, if this is all Yamaha has done wrong, they're doing OK. But I've noticed a growing number of manufacturers mimicking Yamaha's partial damper, and it can't be because it works so well. I'm really enjoying tuning the harpsichord over at the University of Rhode Island for their Bach Ensemble. I don't get to tune a non-equal temperament very often. When I first started work there, I asked them what temperament they would like me to use. I had my Jorgensen in hand, ready to roll! But they were so astonished that I was willing to tune it at all, they just said use whatever temperament you want. The harpsichord was built by Eric Herz, a well-known builder from Boston. No one in the department seems to know exactly how old it is, and I can't find a serial number (though I found a number in chalk on one of the beams underneath). It was apparently one of Herz's earlier ones. It's a small 'chord, one manual, two ranks, very pretty sounding, nice craftsmanship. So what temperament did I use? Before I name it, I'll tell you where I got it and how it's tuned. I received a call a few years ago from an instrument maker on the West Coast who was building a clavichord for a customer of mine. Apparently my customer was going to have me tune it, so the builder wanted to speak with me. He explained what temperament he was going to use in the design, and gave me a website where I could find instructions. The surprise is that last fifth being stretched. Here's a quick explanation. In Western music, we insist that 12 fifths laid end-to-end will equal 7 octaves. Nature has other ideas, however, and 12 pure fifths is slightly greater than 7 octaves. The difference is called the comma, and the question is, what do we do with it? In equal temperament, we divide it equally among all 12 fifths by shrinking each fifth the same amount, 1/12 of a comma. Tempered thus, the 12 fifths do indeed equal 7 octaves, and the fact that the fifths are shrunk is hardly noticed, or at least we learn to not notice the effect. So with this temperament, the first 5 fifths are each shrunk twice what they would be in equal temperament. The next 3 fifths are tuned pure. The next 3 fifths are tuned as they would be for equal temperament. If you add up all the tempering at this point, we have overshot the comma by 1/12, so that last fifth is tuned so that it sounds like an equal tempered fifth, but it's stretched. Now the 12 fifths line up to equal 7 octaves, but the fifths do not sound all the same, as they do in equal temperament. Nor do the thirds all sound alike, or the sixths, or any other intervals. In fact, each of the 12 keys will sound a little different, will have a slightly different "color." It's key color that is missing from equal temperament. The most famous proponent of well temperament was Johann Sebastian Bach, who wrote an entire series of pieces using all 12 keys (plus 12 more enharmonic keys) called The Well-Tempered Clavier. So which temperament did he use? No one knows, but at least one person claims that the very temperament I've described here is, in fact, old Bach's. This is a scholarly hornet's nest I'd rather avoid; go visit the website yourself (link below). I've used this temperament on harpsichords, clavichords, and even a piano, and whether or not it's Bach's, it works very nicely - nice key color, no wolf intervals, works in all keys. It's quick and easy to tune once you get the hang of it. This happens to me every year. As winter approaches, I trade in my light short-sleeved shirts for heavier long-sleeved ones, but with the sleeves rolled up. Then I finally stop rolling up the sleeves. Next thing I know, I'm tuning a piano and as I hit a note with my left hand, I hear an intermittent but unmistakable click. What was that? I try again; no click. Wait, there it is again, what is that? Loose hammerhead? Loose whippen heel? Duh, it's the button on my shirt cuff hitting against the keytop. I fall for it every year. The Piano Tuner's Song is what my teacher at The New England Conservatory, Frank Hanson, used to call the sound of tuning the temperament. Going around the circle of fifths, checking thirds and sixths, makes for an odd but intriguing ditty. Years ago I went to a customer's house and settled in to tune their console. A young boy, five or six years old, was quite excited to have me there, and he seated himself on the braided rug behind me and listened attentively. It's not unusual, of course, for children to be curious about what's inside a piano, and I usually let them hit the keys to see the whippens and hammers move. They soon run off to play, and I resume. This boy, however, did not approach the piano to look; he stayed quietly seated as I tuned, and for much longer than I expected. In time, though, he did rise and walk into the kitchen. "Mom," he cried with exasperation, "I don't know what song he's playing!" It seems, I discovered later, that he thought a piano tuner was someone who came to your house to play tunes for you on the piano. Look at what my pal Chris Warren is up to with old uprights. I have to admit, I was the one who told him how to take a piano apart. He does this to build an instrument he calls the feedback piano. 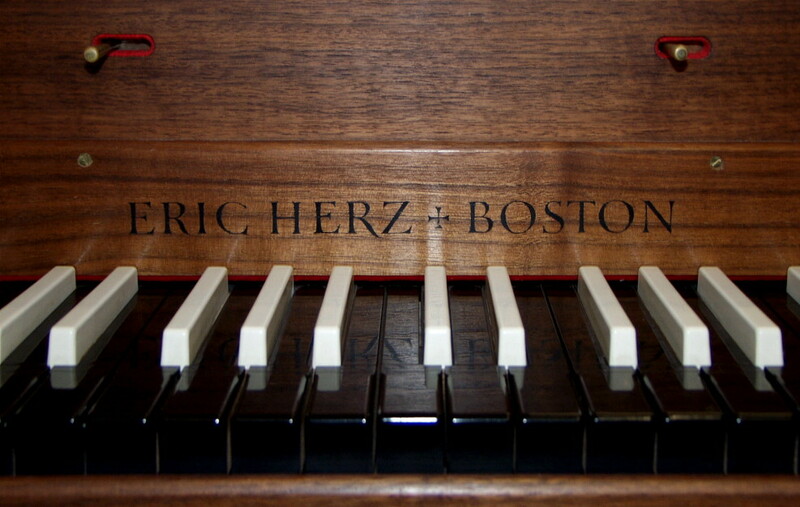 It consists of the soundboard, strings, and plate of a piano still attached to the case. It's rigged with electronics to take input from the soundboard and also to apply vibration to the soundboard, creating a sustained and controllable feedback when sound is introduced. Check out the video. I recently tuned a small Ampico grand, from the late 30's or early 40's I would guess. It had those brittle strings which throw off a lot of high frequencies, making it difficult to tune. I've noticed this before on old Ampico grands, and old Sohmer grands, too. Jewetts are famous for this problem - my heart sinks when I open up a Jewett upright and see all those broken strings in the extreme treble. The high frequencies tend to cause me to tune the strings a little sharp. Then I struggle to get them back down, a struggle exacerbated by the inevitable rust on the strings and corrosion at the agraffes. When I was done, though, the tuning was fine, but the piano sounded a little harpsichord-ish, except for the tubby bass, all of which is typical. I've tuned old Chickerings that were older than a century, and I've not had quite the same trouble, even though the strings were plenty brittle. The difference seems to be that on the Chickering, the string tension is much lower. I've also tuned pianos as old as the Ampico but whose strings were not nearly as brittle. The strings that tend toward premature brittleness must be of a different composition. Even the rust on them looks a little different. Increased brittleness in strings is a natural consequence of age. The strings, which are under constant tension for decades, actually change their molecular structure over time. The atoms creep and shift, relieving some of the stress. This is the string "stretching out," something it does for its whole existence. The string becomes less springy, more brittle, more liable to break, more likely to throw off false beats. The fundamental frequency weakens, making the string sound tinny, and the string's overtones probably become more inharmonic because of the increased stiffness. I think that's what fools my ear when I tune. A few things to bear in mind when tuning a piano like the little Ampico. Be very careful about raising pitch - you don't need to overshoot A440 much because there's not much stretch left in the strings, and I don't recommend raising more than 100 cents without letting the strings rest. Expect false beats - don't mess too much with unisons, it'll be easier to touch them up later after the strings have rested a little. Finally, you'll notice that the brittleness increases as you move up the piano, perhaps because the strings are thinnner. That's why in a Jewett you'll see all those broken and replaced strings up there. There does seem to be controversy and confusion about exactly what happens to piano wire under tension over time. There are several ways that strings "stretch out," but the mechanism I'm referring to is creep embrittlement. A friend teased me once about the announcement on my answering machine. The announcement asks callers to let me know if they are calling about a "piano emergency," so that I will know to call back ASAP. My friend thought "piano emergency" was hilariously over-dramatic. Most "piano emergencies" come about because of a scheduled performance - something goes wrong, or somebody drops the ball on calling the tuner. This was the case with my caller on Friday afternoon. There was a concert scheduled for Sunday afternoon. They were going to use a keyboard, but at the last minute discovered that one of the singers will not perform with a keyboard, she will only sing with a real piano. So they rounded up a piano from someone's home, and then realized it needed tuning. I hesitated to commit - I had already committed to a musical gathering that night in Connecticut, and I knew I wouldn't get home until 2 AM. On Saturday I was to perform with my band, again in Connecticut (90 minutes away), and I had to be there early for soundcheck and a bit of rehearsal. It would be another 2 AM bedtime, and my caller's gig was for early Sunday afternoon. But I knew about the concert, knew some of the people involved, knew it could make good connections for me, it was nearby, I needed the money, so I said yes, and shoe-horned it into my schedule. Late Saturday morning, she called to cancel. She explained, with apologies, that someone else had also been calling tuners for the show, and now they were double-booked. I was off the hook. That was fine by me, but I wonder why I got booted, and not the other guy. Maybe because the person who called me was a woman, and the person who made the other appointment was a man. Of course his appointment would stay, she would have to cancel hers, it would go without saying. But at least we were all civil and pleasant and agreeable, that's the least we can hope for, and the goodwill will pay off one way or another.